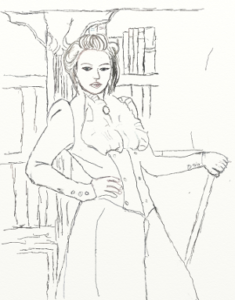 This was my first attempt at using the Steampunk tropes in a story. I have hopes to return to the style in the not too distant future. In fact, the characters introduced here are the basis for a number of story lines I’m toying with. I may possibly write a set of interconnected shorts and bundle them into a single volume. High in the haunted tower of Earlington Manor, I watched Davidson make the final adjustments to the latest version of our ghost trap. He’d positioned three high-backed chairs facing inward and set up the generator by the window. “This is a version of Moulton’s device,” Davidson explained. “Can you really call him?” Sophia said. She held an oil lamp high and the reflected light emphasised the restrained swell of her bosom beneath the stout tweed. My heart fluttered at the beauty of my betrothed… once betrothed. Lowering his goggles, Davidson started the generator with a sharp tug of the flywheel pulley. Crackling sparks flew and wild shadows danced on the walls. Even vented through the window by a flexible hose, the odour of burnt petroleum soured the air. The veil between worlds tore and the room sprang into sharp relief. I felt compelled to sweep my hat from the chair and sit down. Sophia gasped when the hat moved. Her tear-filled gaze absorbed the vision of my ghost. In the centre of the room, ectoplasm coalesced forming the image of a woman equal in beauty to my beloved Sophia. Her translucent gown hid nothing of her feminine charm. “You have opened the gateway for me,” she said, her sultry voice a lure to sin. “Dear lady, your captivity on this plane is at an end,” Davidson exalted. “You are free to…” His words failed when she reached into his chest and stopped his heart. In a frightening surge, the apparition descended upon Sophia, merging with and moulding to my truelove’s form. Sophia’s beautiful features twisted in agony and then smoothed. Restrained by the field until the small fuel reservoir ran dry, the creature prowled the length of the room, her every step an essay in seduction. “This is awful,” Davidson exclaimed.